In addition to the Bike+ app, available in the Apple app store, they also have apps for hiking, walking and running. Bike+ gives users the ability to record standard GPS data and more advanced data such at automatic real-time climb detection and categorization as well as the ability to tag and share ride hazards and incident locations. But as Jame and Ted underscore, it’s not just about the data. Their app gives riders the ability to share ride memories by exporting Garmin TCX and GPX files, posting ride details to Strava and Twitter, and creating and sharing highlight videos. 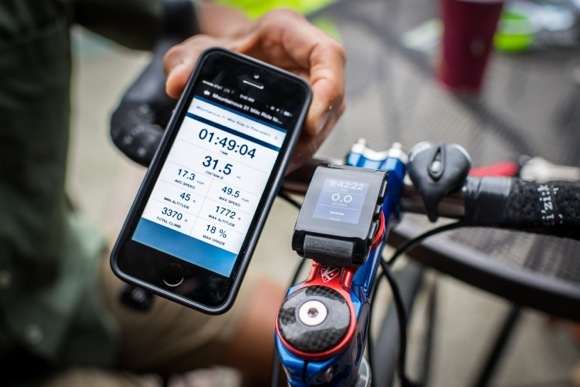 Bike+ also features custom Pebble watch integration, giving the cyclists data — speed, distance, altitude, grade and more — without reaching for their iPhone. The duo’s latest project is a Kickstarter campaign to develop a Pebble bike mount. “The Pebble smart watch makes a fantastic bicycle computer when paired with our ground-breaking Bike+ app,” emailed Ted. “The only thing missing is a great bicycle mount for the Pebble smart watch.